Welcome to Kitchen Klutz!! My name is Sheryl & I'm a mega klutz in and out of the kitchen, hence the name. Please enjoy the recipes and let me know if you have any to share! Cover a large baking sheet with oven-proof parchment paper and spray it with non-stick spray (I used an olive oil spray). 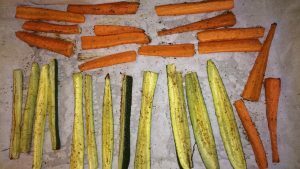 Chop the carrots and zucchini into 8-cm/3-inch sticks, making sure they are even in thickness. 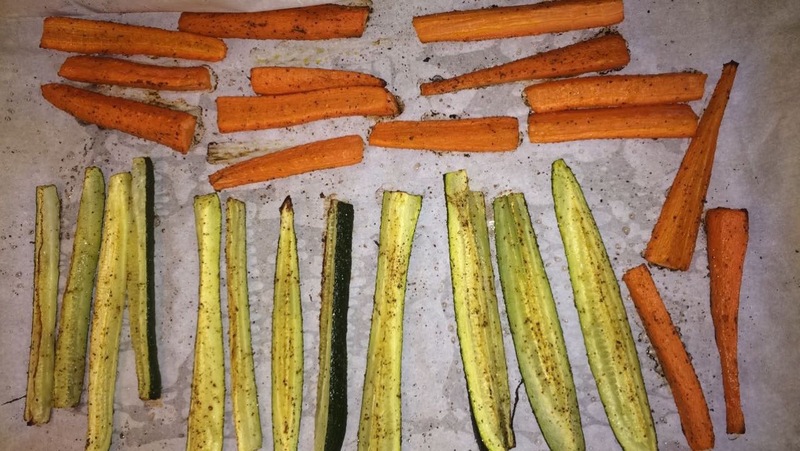 In a bowl, toss the veggies, olive oil and seasonings. Spread the vegetables evenlyon the tray and bake for 20 minutes or until the edges are golden and slightly browned. Copyright KitchenKlutz. All rights reserved.